Name // Porthilly Rock Oyster. Species // Crassostrea Gigas. Location // Porthilly Farm, Cornwall, UK. Merroir // From the clean sandy waters of the Camel Estuary in Cornwall Porthilly Rocks have a good ratio between salinity and freshwater from the river. Characteristics // Creamy, buttery, umami, fresh, clean, cucumber, zinc. An oyster with a delicate Nose and full creamy Body and a lasting Finish. Salinity // 6|10. Meat to Shell Ratio // 9|10 Consistently plump and balanced between gill and body mass. Cup Depth // Deep cup, sometimes reaching up to 2”. 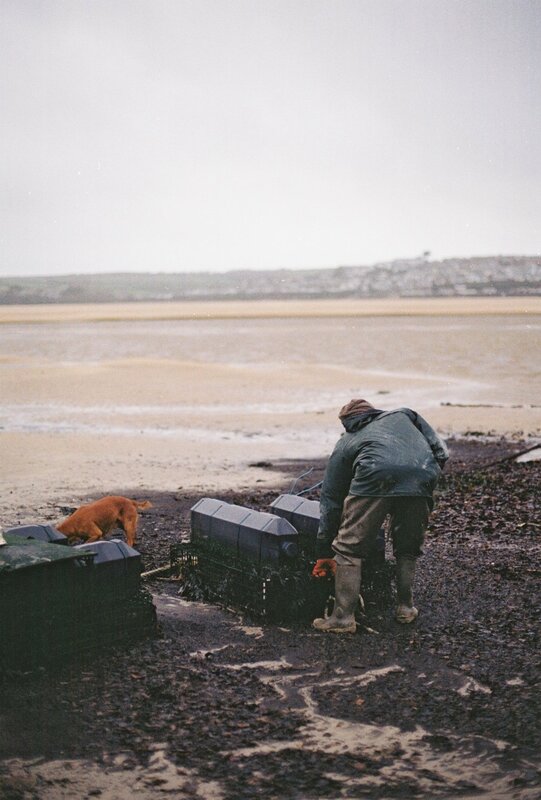 In Porthilly, on the Camel Estuary, Rock Shellfish was founded by Tim and Luke Marshall to grow and purify Mussels, Oysters and Clams. The Marshalls are the fifth generation on the land and sea in Porthilly and stand as the only Oyster farm in North Cornwall. Daily, Tim and Luke Marshall traverse their land sustainably growing their produce. The growth produce of shellfish take between 16 and 24 months turning from microscopic seeds to adult shells. I arrive through howling wind and rain to the secluded village, Porthilly. It’s where I’ve arranged to meet Tim Marshall, owner of Porthilly farm. I stride through the sand, seaweed and whipping wind. How good it feels to have red ice cheeks and fresh breaths. I’m taken by the angular rocks and great expanse of the shore line. At high tide this whole area is covered by the sea. I cautiously walk further around the corner looking for Tim and an orange tractor slowly jaunts towards me, this is Tim with his two dogs on the back, their ears wide in the wind. Tim pulls me up onto the tractor and begins the tour, he’s a man who clearly loves his job. The daily activity and passion for his oysters. They plant the oyster seeds in rectangular racks which float on two barrels until they are big enough to sit on the stands. The stands, like hundreds of lanky scarecrows line one area of the bay. He pulls out an oyster with incredible hues and a deep belly. I get a full tour of the farm, inside I see the purifiers and take a taste of my first oyster. The salty sea water hits you first then a beautiful flavour spreads in your mouth. Wow, the flavour keeps lasting and I understand the craze for oysters. Tim kindly lets me gather the waste shells to take back the studio and as I hope onto the trailer I stand looking at the shore gazing out to the horizon.